EuraAudit International has entrusted to ACTIVA the organization of its World Congress 2016 in Barcelona. 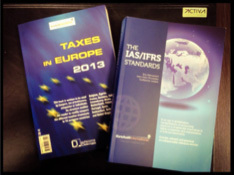 The 2013 edition of "Taxes in Europe" which collects the characteristics of the tax systems of the main European countries. "NIC / IFRS standards", international accounting rules pedagogically explained and discussed with examples. The "Col·legi d'Economistes de Catalunya" has today inaugurated its new headquarters in Barcelona. Our firm has worked actively in the financing of the building and has been recognized as "Protector Firm". The General Accountancy Plan, in the three years that it has been in force since it was first approved, has complicated the management and interpretation of annual statements of accounts for the majority of companies. This at least is the opinion of a considerable proportion of Spanish accountants and auditors, who have spontaneously organized themselves into a Committee with the aim of preparing a consultation document to detail proposals to improve and simplify procedures. ACTIVA supports this initiative through our partner Carles Àvila, who is a member of the Sub-Committee dealing with “Improvements to be introduced in the Annual Report”. The Associació Catalana de Comptabilitat i Direcció (ACCID) has presented its new Executive Committee for the period 2010-2014, of which our partner Emili Coll has been appointed a member. As every year, our professional body (the Col·legi de Censors Jurats de Comptes de Catalunya) organizes the Fòrum de l’Auditor Professional, one of the major events of our profession in Spain, with the slogan “An effective control, audit is the answer”. Our partner Mr. Emili Coll will take part in a workshop called Managing teams in an audit firm. The University Abat Oliba organises on 31st may 2010 a conference on Transparency in non-for-profit organisations. Mr. Emili Coll, ACTIVA partner, has been invited to take part in a workshop that will develop the following subject “Internal elements for transparency: the legislation, the accounting system, the internal systems for control and monitoring”.